Home UFO REPORTS SECTION A Case for Ball Lightning? 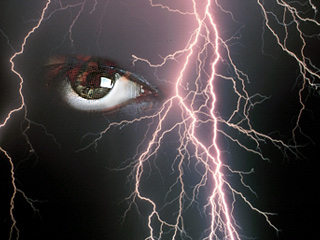 Ball lightning is a curious and somewhat controversial phenomenon. The following case was reported to BUFORA in 1997 and even though it was observed in the fifties, I thought it was interesting with regard to the study of natural atmospheric phenomena that are reported as UFOs, and I wrote to Peter suggesting this was possibly ball lightning. He responded with a copy of a Daily Telegraph article and also a copy of some correspondence from Dr. John Hardwick, both referred below. The following case certainly appeared to have some of the characteristics of the phenomenon. In the winter of 1952 Peter aged twelve and his brother aged seven were at home alone for a short period whilst their parents were out. It was early evening and raining and they were upstairs in their parents’ bedroom awaiting their return. Peter then became aware of a ‘presence’ or feeling that there was someone beyond the bedroom door. There was no noise or any indication other than this. He went over to the door, which was at the head of the stairs and about halfway up the stairs he observed two spherical objects both about 250mm in diameter. They were bright orange in colour and had an almost fiery consistency. The objects were about 1 metre above the stairs one slightly ahead and above the other about 400mm apart, and were moving up the stairs at around one foot per second. Both objects exploded almost simultaneously, the lead one first, and the noise was similar in sound to a toy balloon popping. Peter’s brother appeared at the top of the stairs after hearing the sound of an explosion and they searched the stars for any sign of debris. There was no trace of ash burning or any residual smell. The doors to the downstairs rooms were closed as was the front door. Upon his parents return, his father, an electrical engineer, searched the house and inspected the electrical installations for faults. He could find nothing wrong that could have been responsible for the spherical objects that his sons had observed. It is usually ball-shaped, but sometimes oval. It is rarely larger than tennis ball size, but some researchers believe that very rare bigger forms are unrecognised by science as they are dismissed as UFOs. It can float freely in the atmosphere, often follows power lines, has been known to effect electrical equipment (e.g. Causing neon tubes to light without power or blowing electrical circuits) and can create tingling symptoms with witnesses. It tends to be short lived but has been reliably reported as being visible for several minutes. Theories to explain it are varied but one proposes nuclear reactions, which generate an intense localised radiation field, which may provoke serious illness in a witness. Despite its name it does not require a thunderstorm to form and has appeared day and night, inside and outdoors, in hot, cold, dry and wet weather. In many senses this is a real UFO, even if we identify a case as being so formed. Scientists still do not fully understand what it is or how it occurs and as recently as the 1960’s it was widely rejected alongside UFOs! Since then it has been well described by a physicist witness, so most scientists now accept it! But there is little doubt that many cases get reported as UFOs and never come near scientists. In an equinox programme on lightning presented by channel 4 in November 1994 there was a segment devoted to the ball lightning hypothesis and some first hand reports of people who had witnessed these balls of light. Lightning strikes normally create horizontal magnetic fields all around them, but vertical fields may sometimes form. Under certain circumstances vertical and horizontal loops might link together and form a ball. Glowing plasma could be trapped inside the magnetic field lines. If there was just one magnetic field, it would expand with the plasma, and the plasma ball would explode instantly. But the two fields are constrained by the link between them – they and the plasma cannot expand and the flowing fireball effect lasts until the plasma cools. “It’s perfectly clear that it can last for ten or fifteen seconds” says Ranada. In the cooling plasma, electrons become bound to their atoms. This increases electrical resistance, killing the current within the plasma and weakening the surrounding magnetic fields. The article in New Scientist goes on say that this theory would also explain why the fireball radiates little or not heat, yet its touch can burn. Most of the ball is cold, but along the field lines. The loops and a few streamers coming off the fireball reach temperatures of 16,000 Centigrade or more. A press cutting from the Telegraph in 1996 gives a further significant look at the ball lightning phenomenon. Three of the staff at a print works received electric shocks when a sphere the size of a tennis ball few around their factory in Tewksbury Glos. A forklift truck driver saw a dazzling blue /white ball bounce along the roof and then pass through netting into the building. Once inside, it roared along girders and hit printing machinery sending sparks flying everywhere. It finally hit a window and exploded with an orange flash, blowing out the telephone switchboard and lighting up the whole place with sparks everywhere. Apparently the fireball raced around the building and the bang was so loud that it was even heard by a deaf employee. The staff claimed it was like something out of Star Wars. Three people received electric shocks and one lady was hit in the shoulder and felt as though ‘Frank Bruno had punched her’. One worker claimed that the lightning ball was unleashed when a jet plane passed through a cloud overhead. Scientists have been sceptical about the existence of such a phenomenon, but it has been reported so often and so consistently that most are convinced that ball lightning is real and often sighted during thundery and humid weather, where it appears as a free floating globe of glowing gas usually between the size of an orange and a grapefruit. ‘We are a commercial group, mainly concerned with effects of lightning on aircraft and unfortunately have little time to pursue the subject to its widest boundaries. Dr. Harwick suggests reading the chapter on ball lightning by Singer in The Physics of Lightning. Singer also wrote a whole book on the subject ‘The nature of Ball Lightning’ (Plenum Press 1971). He also states that there are many theories as to what causes ball lightning. To illustrate this unusual phenomenon even further, I received a phone call from a lady, who reported an unusual event, which occurred in her home in July of 1995 whilst sitting on the settee with her boyfriend. They both noticed a ball of light outside the window and were astonished and very apprehensive when this ball of light passed through the closed window glass. She described it as a blue/green spinning light, the size of a football. It moved in a downward trajectory at speed past the settee on which they were sitting and then shot out though the patio window pane at the other end of their lounge. This event took place within several seconds. The couple involved had no idea what they had observed and were very puzzled. I suggested that it might have been ball lightning and explained a little bit about the characteristics of this unusual phenomenon. There is certainly no doubt that ball lightning and other reports of balls of light observed at close range are reported more frequently than realised. This is most worthy of continued investigation when we are looking at the field of UFO study.